UNITED NATIONS, November 5 -- Nearly two years after becoming UN Secretary General, Ban Ki-moon is intensifying efforts to change the employment system, including holding town hall meetings with staff to try to convince them that his changes will be good. Wednesday Mr. Ban spoke for more than half an hour with an auditorium full of staffers from the Department of Public Information. It was a closed-door session, as enforced by a UN security officer, but Inner City Press managed to ask questions on their ways in and out to staff and even to Mr. Ban himself. His reforms, it emerges, are not fully understood or embraced by staff, and have begun to be conflated with changes being proposed by the U.S. Mission to the UN, on which Inner City Press has already exclusively reported here. Ban spoke less guardedly, or less diplomatically, about his proposal to require UN staff to change jobs and even Departments in a speech earlier this year in Turin. In this remarks, Ban appeared to some to demean the work of staffers who write reports, or who have been in the same unit or job for more than five years. The line most quoted from the speech, first reported by Inner City Press, was that Ban had "tried to lead by example but no one followed me." The town hall meetings are viewed as an attempt either to repair the damage caused by the Turin speech, or at least to better explain it. In the run-up to Wednesday afternoon's meeting, DPI staff had been told to expect "a special guest." 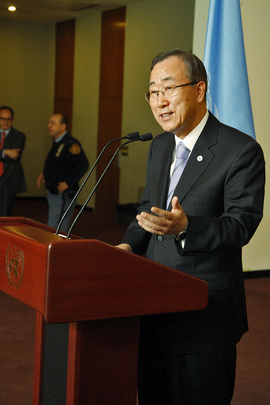 Several were not aware that Ban Ki-moon was coming. He arrived at 3:13, accompanied by his chief of staff Vijay Nambiar, his senior advisor Kim Won-soo and his spokesperson Michele Montas. Once inside the standing room only auditorium, having been introduced by DPI chief Kiyotaka Akasaka, Ban told staff that mobility is important and will restart creativity. He spoke of simplifying UN contracts. Afterwards in lobby, a UN staffer asked if that would impact the education benefit that is offered. Kim Won-soo answered that G or General Service staff are not entitled to that benefit anyway. Inner City Press asked to pose a question, but was told no by the Spokesperson. Ban gestured, go ahead and ask one. What is the connection, it was posed, between Ban's proposals and those being made by the U.S. Mission to the UN, to Ban's management chief Angela Kane, to member states and regional groups? "They are two different proposals," Kim Won-soo answered, as Ban nodded. The U.S. proposal is about human resources management, he added. While that may be the buzzword, the proposal still seem similar to many. The U.S., for example, wants to cut back on benefits such as the education grants, which while they may benefit U.S. schools are denied to American staffers. A Ban supporter points out that Ban was pitching contract harmonization before the current U.S. push. While true, as far as it goes, the U.S. Mission during the last General Assembly was talking about human resources reform, for cost savings and for U.S. staff. In the half-dozen questions Ban took inside the auditorium, he was asked broad questions from climate change and the war in Congo to gender balance in the UN. The last he answered by reference to the female chiefs of the Office of Legal Affairs and Department of Field Support, as well as his often-traveling Deputy Secretary General. On climate he said he's written to 27 European Union members, on development to 35 heads of state. Afterwards, numerous staff expressed frustration with what they called the disconnect. Some described Ban as a stalking horse seeking to cut benefits, who "still doesn't understand how the UN works," as one senior staffer put it. Others said at least he is trying, at least he came, even as he prepared to travel to Kenya to take part in meetings about the war in Congo. At Wednesday's noon briefing, Inner City Press asked Ban's spokesperson for a response to the UN Joint Staff Pension Fund's reported loss in the third quarter of $4.5 billion or 11.2%. The spokesperson replied that "What I was given as an answer is that the Pension Fund has not suffered in any way from the financial crisis. There have been fluctuations, but it hasn’t affected the overall value of the Fund." If that definition of fluctuation applies, there is no global crisis, only massive fluctuations. There is a growing call for candor. We will continue to follow this. Footnotes: A question Wednesday is whether the administration of just-elected Barack Obama would continue to push the proposals unveiled at the eleventh hour or month by the George Bush State Department. Already word in the UN's Fifth (Budget) Committee is that some members are playing for time, to get past the December session into the post-Bush time in May. But while Ban's communications director on Wednesday told some reporters that Obama "is a UN person," the changes he may want are not clear, particular as may relate to Ban. As one observer put it in terms of reform, just as "only Nixon could open China," since his right wing bona fides were assumed, so too only Barack Obama would really reform the UN, since he is assumed to be a multi-cultural pro-UN multi-lateralist. Let the real reforms, including a Freedom of Information policy and at least partial removal of immunity, begin. One sample abuse: a former UN staff member who says he was denied renewed employment based on discrimination has been told by the UN that he can neither avail himelf of the UN internal justice system, since he is not a staff member, nor of the US justice system since the UN is immunity. As one questioner asked Wednesday just after Ban had left at 3:46 p.m., where's the accountability?